they probably don't have to pay hush money to women like Donny had to. It’s not an accident that the US government is making it so difficult for journalists, lawmakers, lawyers and others to bring you images and firsthand accounts from these separated parents and children. They are hiding the truth from you because they fear your reaction. trump thought Americans would not care about the treatment of poor non-white Latino Central American children. 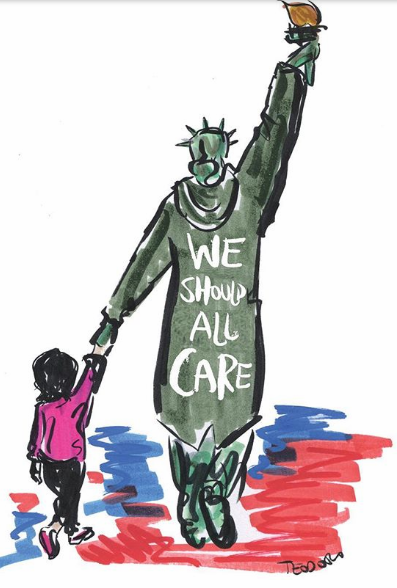 trump thought other Americans would not care because he does not care about these foreign Spanish-speaking children from places he designates as s******* countries. The American people proved him wrong. 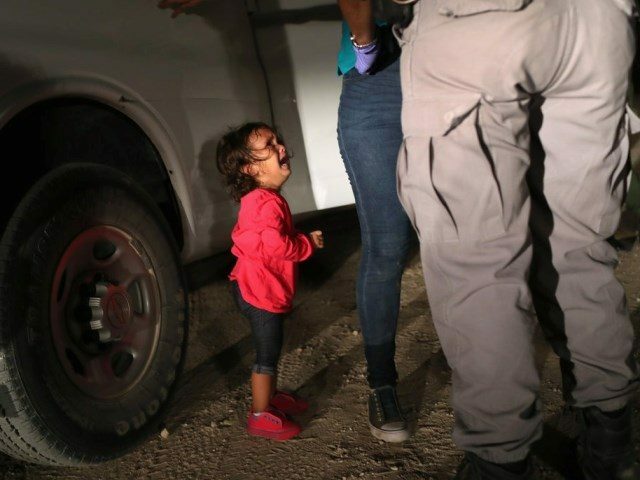 Let this image of a crying child haunt Donald Trump politically. He's earned it. True, but it will be very effective propaganda. This is why GOP members of Congress up for election in November pushed the panic button and begged Trump to rescind the policy. "here's lookin' down at you, kid." This is not left wing propaganda. Propaganda is what comes out of the White House on a daily basis. Traumatizing children by separating them from their parents had Trump crossing a moral line that offended a majority of Americans. His political opposition should throw images such as the Time cover up time and again, not only as a reminder to voters as to the kind of man now occupying the Oval Office, but as a warning to Trump of the political price he can pay if he goes too far. Even now we don't now how many of the 2300 children will be reunited with their parents. The paperwork is sketchy as to their whereabouts because there was no organization to the separation. And there's no sign that the White House gives a damn. Of course, there should be constant reminders of this black stain on American history so that, hopefully, no occupant of the White House (Trump included) will ever go there again. This isn't a left wing media thing, much as the WH (and Fox News) will undoubtedly try to paint it to be. TRUMP BROUGHT THIS ON HIMSELF! From a political perspective it was a major blunder to separate the kids from their parents. The propaganda portion is that only the parts that fit the pro-illegal-immigration folks is being told. E.g. that a simple way for a family to avoid being separated is to NOT come into the USA illegally as a family and that those that seek asylum legally are NOT separated. From that POV the illegal immigrant parents brought this (being separated), on themselves. But this POV is dismissed by those that believe there is nothing wrong about entering a country illegally. Still a major blunder from the Trump admin that only decreases the chance that Congress will pass immigration reform. Thankfully we have heard that this little two year old girl has not been separated from her mother. This little two year old girl with the determination and the seriousness Way Beyond her years has become not just the focal point for the trump Zero Tolerance policy but also the poster child for trump's cruel, inhumane and Un- American immigration policy. However, the fact remains that there are thousands of children who have already been separated from their parents. And now we're hearing that they have been spread all over the United States in at least 14 States. United and American Airlines have unequivocally refused to fly any of these children. We know also for a fact that the trump Administration has no organized plan to reunite these children with their parents. What the future holds for these children we don't know. If they're to be taken into the foster care of the United States system that would be a tragedy because they have parents who want them. Plus the United States Foster system is sadly in disarray and working on a below-average level. The Mayor of New York has received some of these children and he says that they have chickenpox, lice and are generally unwell. As the days go into months it's going to be more and more difficult to find and track down these children to put a light on their condition and what is being done to reunite them with their parents. This is the point where we really need the media to stay alert and to coordinate information about these forced foreign orphans. trump has already done all he can to bullying and harrass our mainstream journalists. Now it's going to be their responsibility to help these children by getting information about them and alerting the public. It was the mainstream media - - primarily the three television networks that alerted the public to the vicious and hateful violence against the American activists of the Civil Rights Movement. Talking about something is one thing but actually seeing the video is another. CBS News, NBC News and ABC News was there when the Southern white supremacists tried to burn the Freedom Riders Bus-- with the Freedom Rider Activists from the North still inside the bus. It was not just the public that became inflamed - - it forced the Kennedy administration to to get involved. In some cases the white supremacists beat the white network reporter along with beating up the black and white civil rights activists. Howard K Smith was fired from CBS News because he insisted upon telling the truth about the Civil Rights Movement on air. These are the kind of reporters that we have in the mainstream media and they will go on telling the truth and showing the truth about these forced foreign orphans because they're working under the First Amendment of the Constitution for the American people. 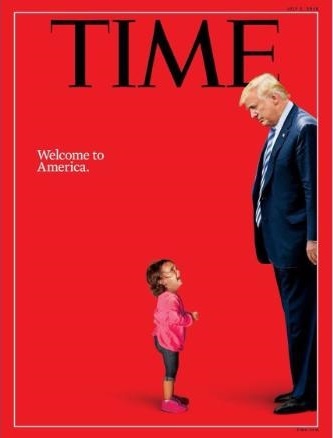 That little girl is a real human being - - and worse than that there are thousands more that trump is responsible for being orphaned. but they're still human and they deserve our compassion and consideration. Hey little girl. Bet you'd be tasty in my taco salad. ICE lied, told flight attendants the kids were a soccer team. They weren't. Now this flight attendant won't work when the US transports children away from their parents. "I might as well have been a collaborator on their transport." You just reminded me of an old National Lampoon magazine satire, the birth of Ed Meese (remember him). he was in a huge Ortega taco shell covered in ceremonial bean dip. Photographers should get their facts straight before publishing. all they cared about was that she was crying and they could get a picture of it to use against trump. Yep, Reagan's AG (can't remember if Ed served in that position for the whole two terms). was not a Daniel Ortega taco shell. All immigrants in the USA, who don't have solidarity for the plight of other immigrants coming into this country should just go back to where they came from. If either one of you had this thread thoroughly you would know exactly the background of this photo and why it's so significant. Also I could say if you had listened to a decent news outlet that had journalistic ethics you would already know the full background of that story.